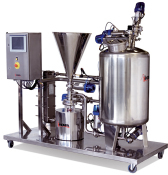 The V-type blender is used to produce homogeneous solid-solid mixture. Mixing is a common process step in the manufacture of products for industries such as healthcare, pharmaceutical, food, chemicals, cosmetics, detergents, colorants, fertilizers and plastics. Examples of materials or substances mixed in this way include pharmaceuticals, flour for confectionery, fish meal, refined or white flour, whole wheat flour, flour for coating, dextrins, enzymes, coffee, cocoa, milk powder, chocolate, gelatine, crème caramel and dessert powder, baby food, custard powder, starches, seeds, pigments, colorants, cosmetics, powdered or granulated plastics, fiberglass, etc. The unit consists of two cylinders arranged in a "V" shape with an angle of 80°. A manually actuated inspection and loading port is provided at the end of each cylinder, allowing access to its interior. The product outlet is located at the point where the two cylinders are joined and is fitted with a manually or automatically actuated butterfly valve. The geared motor and the bearing system are located within the lateral supports holding the blender body. The mixture is discharged through a hermetically closing butterfly valve which can be operated manually or automatically. The unit is provided with a guard rail with electrical safety to prevent the operator from accessing it when in operation. If anyone should gain access to the unit, for safety reasons, the operation will cease. The series consists of 10 models with a total capacity of 50 to 4200 litres and a useful capacity of 50% of the total. Mixing times vary between 3 and 15 minutes depending on the mixture. The unit incorporates a guard rail with electrical safety, according to EC safety standards. The unit is manufactured in AISI 316 (EN 14404) quality for all parts in contact with the product and AISI 304 (EN 14301) for the supports and the rest of the equipment. The internal and external surfaces have a bright polished finish. Due to the polished surface and absence of edges or corners, the unit can be easily cleaned either manually or automatically with CIP system. This unit allows the incorporation of a liquid spray system to introduce liquids in spray form during the process. The injector is connected to the spray nozzles by means of a rotary system and is fed with additives from a pressurized tank or by means of a variable speed displacement pump at constant pressure. The automatic stop positions are: loading, discharging, and sampling. Before stopping at one of these three positions, the system performs a cycle which slows down the mixer in order to reach the stopping position with the highest possible accuracy and remains halted at that point. 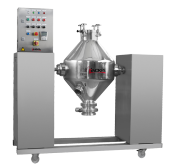 The unit can be equipped with an automated loading system for introducing powders and granules into the blender body by means of a vacuum unit with self-cleaning hoses. It prevents creation of dust. 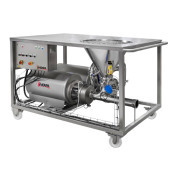 The skid can also be provided with a complete monoblock vacuum unit with liquid ring pump. self-cleaning filter; as well as a control panel for the unit. 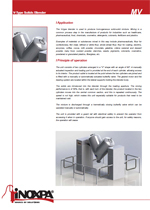 The loading/discharge can be carried out with pneumatically actuated retractable hermetic bellows. 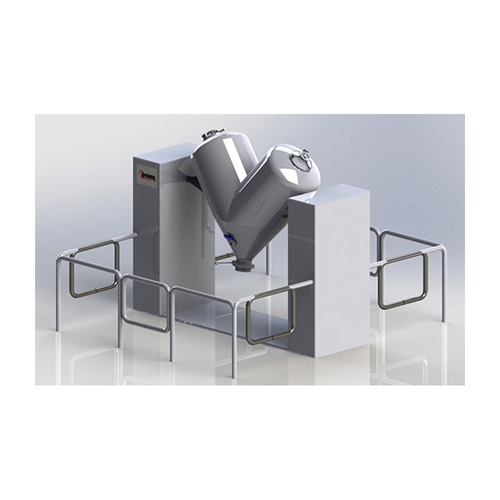 This system and the vacuum loading/discharge can be combined. Résumé El mezclador tipo en “V” realiza una mezcla homogénea de sólidos. 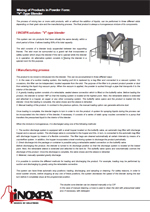 Résumé The V-type blender is used to produce homogeneous solid-solid mixture. Résumé Il mescolatore tipo a “V” realizza una miscelazione omogenea dei solidi. Il processo di miscelazione è un’operazione comune nella produzione destinata all’industria farmaceutica e sanitaria in generale, alimentare, chimica, cosmetica, detergenza, coloranti, fertilizzanti e plastiche. Résumé El proceso de mezcla de dos o más productos sólidos, con o sin adición de líquidos, se puede realizar en tres equipos diferentes en función de su granulometría y el proceso de fabricación. Résumé The process of mixing two or more solid products, with or without the addition of liquids, can be performed in three different skids depending on their grain size and the manufacturing process.